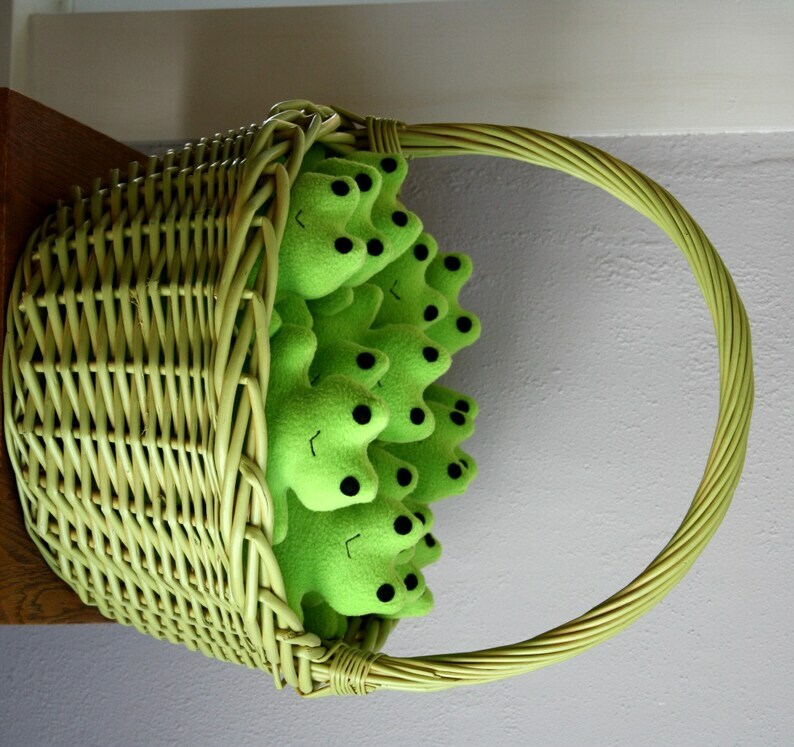 This froggie squeaky fleece dog toy is a good size for pups with smaller mouths. And bigger dogs as well. Made from bright green 100% polyester fleece with acrylic felt eyes and a machine stitched smile. All parts are machine sewn on and seams are sewn with a triple stretch stitch. Stuffed with 100% recycled polyester fiberfill and it has a squeaker for extra fun! This is machine washable! Don't want a squeaker? Let us know! Froggie measures 9" high by 5.5" wide. You get 1 frog. Basket not included. The fleece may be a slightly different shade than pictured. I've had a hard time consistently finding the same color. No toy is indestructible, always supervise your pets playtime with stuffed toys. LOVE Froggie! My beagle boy loves his froggie and tug of war is how he likes to play best with it! So cute! Our dogs love them!